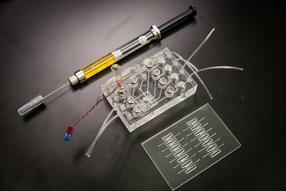 The two key lab in a chip components with a syringe for scale, which will allow for rapid liver toxicity tests. 30-Sep-2015: Researchers at Houston Methodist, along with collaborators at two major Singapore institutions, have developed a lab in a needle device that could provide instant results to routine lab tests, accelerating treatment and diagnosis by days. This single, self-contained medical device will be effective, for example, in quickly detecting liver toxicity which is a common side effect of chemotherapy. This device will test toxicity in 30 minutes while current liver toxicity tests take several days due to multiple steps required before a physician interprets the test results and communicates them to the patient. The invention was developed jointly by Houston Methodist, Nanyang Technological University (NTU Singapore) and the Singapore Institute of Manufacturing Technology (SIMTech). The investigators demonstrated that two important steps of the lab in a needle approach accurately detected liver toxicity in pre-clinical models by measuring two genetic indicators of toxicity in AST and ALT. The proteins represented by these indicators are among the most sensitive and widely used liver enzymes in all liver function tests today. "We used the concept of lab on a chip, which compresses the entire function of a laboratory diagnostic test onto a tiny microfluidics chip, to create lab in a needle," explained Stephen T.C. Wong, Ph.D., P.E., Chair of the Department of Systems Medicine and Bioengineering at Houston Methodist Research Institute. "Our goal is to integrate sample acquisition and preparation into one device, a significant challenge that has slowed the development of point-of-care testing." The joint research group sought to develop a new class of device to collect patient samples, prepare them for testing, evaluate toxicity, and display results in one easy-to-use process, allowing doctors and patients to immediately discuss treatment options. A compact device would also make possible diagnostic testing outside of a clinical setting, such as at home or in the field. "What we have proven is when the doctor takes a blood or liver sample, the sample can be prepared and analyzed using lab on a chip methods which eliminates the need for wet laboratory work and experts," said Joseph Chang, Ph.D., a professor of circuits and systems and biomedical engineering expert who is the Director of Virtus, the Centre of Excellence in IC Design, at NTU's School of Electrical and Electronic Engineering. "Our method significantly reduces time, manpower and costs and yet has the same accurate results." Sample preparation was accomplished on one chip that incorporated a miniature motor and microfluidics, while amplification was performed on a second connected chip, said Wong, who is also a professor of radiology, neuroscience, pathology and laboratory medicine at Weill Cornell Medical College. Elevations in the two examined gene markers of liver toxicity were then accurately detected and consistent with previously known changes, indicating that lab in a needle is an appropriate diagnostic option. "Our next steps are to integrate the sample preparation and analysis chips into a miniaturized device. SIMTech will tap on its manufacturing process capabilities to develop a cost effective lab in needle device that can be scaled up for mass production. This will enable the mobile technology to be expanded to test for a number of health conditions in outpatient settings or outside hospitals," said Zhiping Wang, Ph.D., a principal scientist in microfluidics and Director of Research Programmes at SIMTech. The study outcome represents the first time that all processes involved in the lab in a needle were integrated together successfully, and represents an important step in bringing a new real-time, easy-to-use diagnostic to the clinic and the field with immediate potential to improve patient outcomes and quality of life.